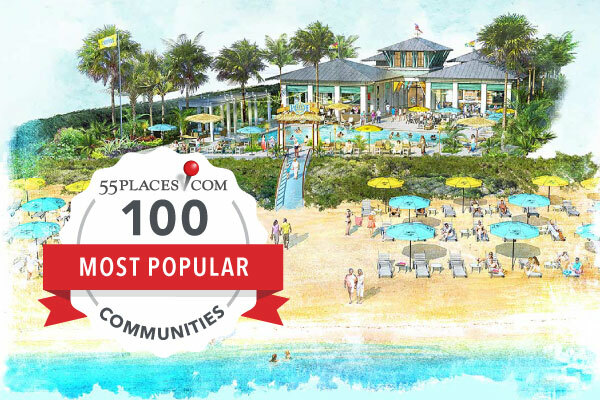 Check out 55places.com's 2018 list of the 100 most popular active adult communities in the United States. The world of active adult communities is constantly evolving and changing. Every year, new communities sprout up across the U.S., from Florida to New Jersey to Nevada and beyond. Every year, demand for unique amenities adds something new to the 55+ lifestyle experience. While there are certain legacy communities that continue to set the tone for active adults, newer ones are setting a new trend. The great news for homebuyers is that just about anything they could want from an active adult lifestyle is available to them. Of course, some of those communities remain more popular than others. Every May, 55Places.com researches various data points, including unique pageviews and homebuyer inquiries, to determine which ones are the most popular around the country (read more about our methodology here). Since we began doing this list in 2013, The Villages has been No. 1 every. single. time. However, a bold newcomer has finally dethroned them. In fact, the 2018 edition is full of shakeups that prove just how much 55+ communities are changing. 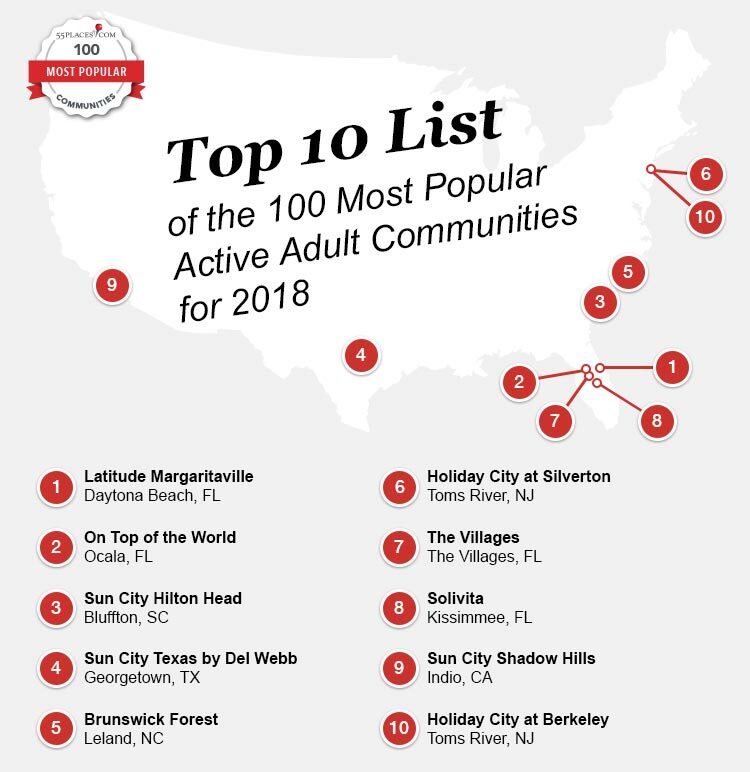 Read below to find out about the top ten communities on our list as well as the full rundown of the 100 most popular active adult communities of 2018. A geographic breakdown of where the top 10 most popular communities reside in the United States. In February 2017, Minto Communities announced that they were partnering with Margaritaville Holdings to create new active adult communities inspired by the music and lifestyle of Jimmy Buffett. The initial Latitude Margaritaville gated community would be built across 1,600 acres in Daytona Beach and would ultimately include 6,900 single-family homes with prices starting in the low $200s. The lush amenities plan calls for an amphitheater for live music and a restaurant offering Margaritaville-inspired dishes and drinks. While sales only officially started in November 2017, this community received a staggering amount of interest from potential Parrothead buyers and demand is expected to remain strong into next year. On Top of the World hasn’t made it to the top of our list yet but they always get extremely close. For the fifth consecutive year this Ocala community comes in at No. 2. They probably aren’t going anywhere as the 5,000-or-so-home community won’t stop growing until it tops out around 10,000 homes. With so many residents, the community makes a real effort to organize clubs and special interest groups that cater to everyone. It’s no surprise it remains one of the most sought after active adult communities on the site. The largest active adult community in South Carolina is another common entrant on this list and with 8,000 homes, world-class amenities, and 54 holes of golf, it’s not hard to figure out why. Located in Bluffton, Sun City Hilton Head tries to offer something for all kinds of potential buyers, with homes ranging between the high $100s all the way up to the $900s. All residents end up flocking to the 45-acre town center and amenity campus, which include the Pinckney Social Hall, Purrysburg Fitness Center, and Yemassee Crafts Center, to name a few. The location, just 13 miles west of Hilton Head Island, also continually makes it a popular choice. Sun City Texas has crept up our rankings for a few years now, cracking the top 20 in 2014 and coming in at No. 13 last year. This Georgetown, Texas community finally made the leap into the top five this year. The sprawling community spans 5,300 acres, providing a majestic setting for 9,900 homes and three 18-hole golf courses. Plus, the recreation and activity complexes combine for more than 86,000 square feet of indoor amenities. While the Brunswick Forest community in Leland, North Carolina doesn’t get the attention that the previous ones often do, they must be doing something right because over 20 percent of the people who decided to take a closer look at the community in the last year through 55Places.com ended up calling it home. As for what attracted them to this 4,500-acre retreat with 8,000 homes, we’re guessing the 18,000 square-foot Fitness & Wellness Center, Cape Fear National Golf Course, and The River Club all had something to do with it. Holiday City at Silverton can’t match most of the aforementioned communities when it comes to national awareness and hype, but clearly, they’ve got something going for them. More than any other community on our list, this one turned prospective buyers into actual buyers (one in every three!). This Toms River, NJ community was one of the first active adult communities in the area and is now a thriving neighborhood of 1,595 homes. The affordable price (low-to-mid $100s) coupled with a thriving scene in Ocean County makes it a must-see. After five years at the top of our list, The Villages has now dropped all the way down to No. 7. But perhaps that’s only because the competition is getting stiffer as this notable active adult community is still a force to be reckoned with. Spanning three counties, three zip codes, and over 20,000 acres, this self-sustaining town full of 55 and better residents includes more amenities per capita than any city or age-restricted neighborhood in the country. So, yeah, they’ve got a lot going on. This 4,300-acre community will eventually include 5,900 attached and single-family homes. In the meantime, the residents already here will just have to make do with the 32,000 square-foot Riviera Spa and Fitness Center, 19,000 square-foot Palms Amenity Complex, Starlite Ballroom, Waterfront Galleries, Freedom Park recreational sports complex, and Stonegate Golf Club. Solivita’s Kissimmee location isn’t too shabby either, located close to Universal Studios, Kennedy Space Center, and Walt Disney World. The top-rated community on the list from California, Sun City Shadow Hills is located in the Coachella Valley’s Indio. It’s another top community on our list that might not get the eyeballs that the bigger ones get but more than one out of every three buyers who looked at it this past year ended up becoming a homeowner, so there’s something in the water here (even in the desert). The 35,000 square-foot Montecito clubhouse and 14,000 square-foot Santa Rosa clubhouse are the central hubs for all community activity here, though being located in the “City of Festivals” doesn’t hurt either. Rounding out the top ten marks a return to Toms River, this time in Holiday City at Berkeley. Making its third-consecutive appearance on the list, this Southern New Jersey community hosts more than 10,000 homes and provides retirees with an enviable line-up of amenities, most of which are spread across six clubhouses. They even make it so you rarely need to leave the community thanks to the inclusion of doctors, pharmacies, banks, mini-marts, delis, restaurants, bakeries, and clothing stores.